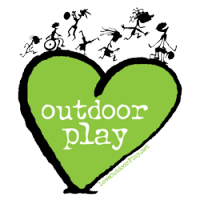 In a noisy and busy playground I think it is very important to provide areas within the space where children can retreat to when they need to be quieter or more reflective. Sometimes the children will create their own spaces within areas too - we have a pallet den at the back of the slide and some days it is used as space to just sit and read books whilst on other days it is a busy hub of climbing children. Our willow dens have really bloomed in the last few dry weeks and the children are enjoying going into them to have conversations and be away from the business of the wider playground. It is lovely to hear snatches of conversation from within them or singing etc. as two or three children gather inside them. We created a little reading nook under the slide a few years back and you often find solitary children in there enjoying books or again a little group gathered together sharing a favourite book. This class added a few extra chairs to allow for more friends to pile in. The tunnel in between the 2 slides always proves a popular spot for children to gather together and chat or just watch the world go by - it is also the go to spot when a child knows they have done something they shouldn't - I think they realise no adult will be able to get up there to them! Some quieter children are drawn to the chalk board or to just sitting chalking on the ground, oblivious to everyone and everything else. When designing new playground spaces I believe that little spaces to be out of sight and away from the hustle and bustle are important. I can only imagine that nursery with 25 other 3 and 4 years olds must be hard for those children who are introverts and they really need time to be allowed to just sit and reflect on they have experienced that day. 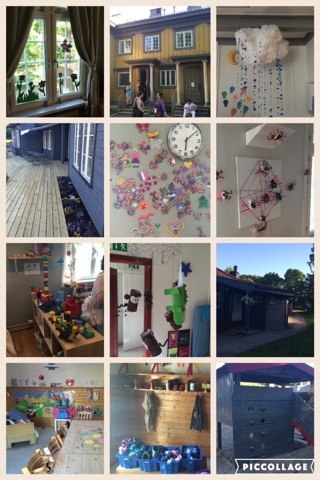 Creative use of ICT in the kindergarten. Those who know me, are well aware that I am always looking for opportunities to travel through work after being bitten by this bug over 12 years ago through the British Council's Comenius programme (now called Erasmus Plus). Between 2004 & 2011, I was fortunate to be involved in projects that allowed me to visit settings in Norway, Italy, Poland, Sweden, France & Turkey. And have also had opportunities to visit Iceland & Lithuania through separate ventures. So, a few weeks ago, I got an email through to say the British Council were running 3 PDW (professional development workshops) across Europe, and luckily one was really geared for me - Creative use of ICT in the kindergarten. I applied immediately and waited to hear whether I was successful or not, knowing such a course was bound to be very popular. Imagine my delight when I got a place! It is great to actually meet up with colleagues before embarking on a project. From the very first session, I knew this was going to be a great workshop, Peter from Denmark, shared loads of easy ideas to get the youngest children using ICT to acquire new skills or reinforce new knowledge. It wasn't about children all having access to an individual tablet or device or playing loads of games but about learning how to take photos, how to classify photos or justify what they have taken etc. 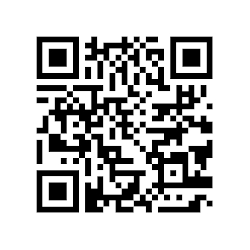 Over the 4 days we go to test out lots of different apps & resources & more importantly, to chat to each other about how ICT is integrated into our curriculums. 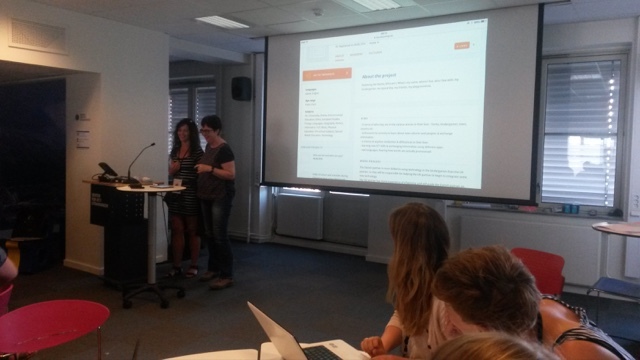 We also had time to listen to some colleagues talking about their practice. 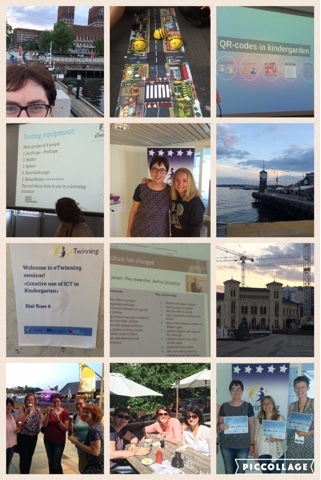 Me and my new eTwinning partner, Lone from Denmark. I came back, totally enthused & raring to get going. It is not that common to attend events like this & get something almost every hour that I was able to take back to nursery & use. 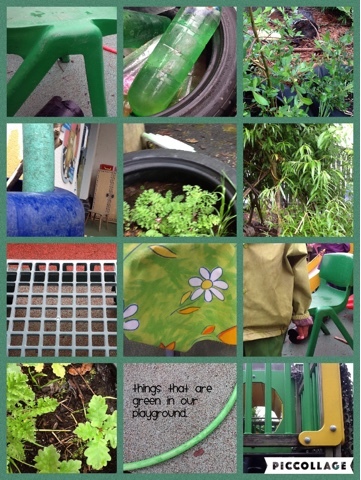 I just asked each child to find 3-5 green things around the playground. 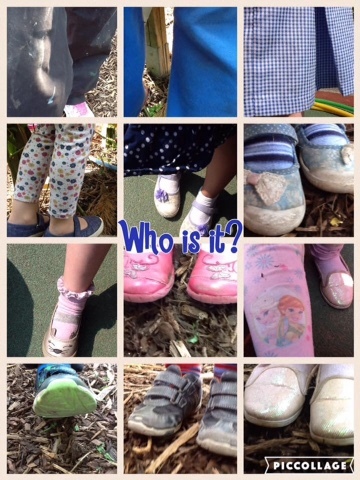 In just 2 days since I have been back, the children have had so much fun using the iPads to document their favourite things in the playground, green things or just created a guessing game based on shoes! 5 children & I also made a very short movie using StopMotion. I honestly hadn't though this was something nursery children could do until I saw some of the movies coming out of the Norwegian kindergartens. A great idea that was shared was from a Danish colleague - they use BookCreator to make transition books for their children. This is such a lovely idea & I want to try it for next year. A major highlight for me was the unexpected opportunity to visit 2 kindergartens on the Saturday afternoon. So, my advice to any colleagues is, to keep an eye out for future PDW's on offer from the British Council & get your application in.